Inspire citizen action through stewardship, monitoring and education to restore, protect and enhance the St. Clair River and its watersheds. Remain a highly visible champion for St. Clair River watershed programs, issues, research, policies and partnerships using sound research, respected advocacy and innovative education. We believe that the St. Clair River and its watersheds should be a thriving ecosystem that is protected to maximize environmental, social, recreational, and economic values and services. We are headquartered in Port Huron, Michigan and serve all of St. Clair County. Our organization consists of a volunteer Board of Directors, paid staff and consultants, and volunteer stewards. 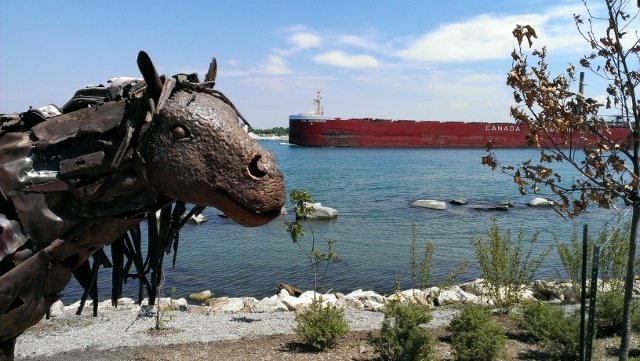 As the Blue Water Area’s largest environmental non-profit, Friends of the St. Clair River Watershed works with numerous partners on the Canadian and American sides of the St. Clair River on a variety of initiatives, including habitat stewardship, water quality monitoring, river cleanups, and promotion of responsible water-based recreation. We blend watershed management efforts with scientific research to provide technical consultation on a variety of water quality issues ranging from riparian habitat restoration to invasive species management to green stormwater infrastructure improvements. We keep watch on emerging and controversial issues such as excessive nutrient inputs, pharmaceuticals and microplastics, climate change impacts, and energy pipelines. We serve as a fiduciary for local grant projects partnering with the private, nonprofit and public sectors. We are supported by contracts, sponsorships, grants and donations. We accomplish our goals through the use of research-based data, community partnerships, and citizen science to influence decisions and actions made by local, regional and state agencies.